Max Lewinsky: [calling it in] Nathan? Nathan Bartnick: Talk to me. Max Lewinsky: Yes, it's tonight. Sternwood is doing it tonight. Nathan Bartnick: Jesus, Max, you've got it! Where? Nathan Bartnick: Are you sure? Max Lewinsky: Yeah. Yeah, I'm positive. It's been a long time since I have seen so much advance publicity for a film. Underground stations and trains, buses and billboards in London seem to be festooned with posters advertising "Welcome to the Punch". There has also been a noticeable TV advertising campaign in the UK, aimed at plugging the film's supposed entertainment value. It is clear that "Welcome to the Punch" has a substantial PR budget attached to it. I am not surprised that so much effort is being made to convince potential viewers of the film's credentials. Although "Welcome to the Punch" is a reasonably entertaining film, it is ultimately a disappointing one. It has more style than substance. It's a slick, glossy thriller that looks expensive. However, it is also a bleak film with (apart from one funny scene that is a strangely effective mixture of humour and tension) little to lighten its almost unremittingly depressive milieu. "Welcome to the Punch" is an attempt at modern day noir. It seems to me to have been heavily influenced by some of the recently successful TV crime series emanating from continental Europe (primarily Scandinavia), such as "The Killing", "Borgen" and "Spiral". However, it's not as good as any of those programmes. 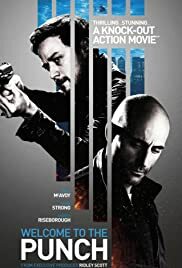 A few years ago, criminal mastermind Jacob Sternwood (Mark Strong) injured London detective Max Lewinsky (James McAvoy) and fled to Iceland to escape the clutches of the police. He has now returned to London because his son has been shot and injured and is critically ill. This gives Lewinsky the opportunity to try to apprehend him for his past misdemeanours. Thus begins a complex tale of revenge, political and police corruption and obsession. "Welcome to the Punch" is entertaining. It is beautifully filmed and is a visually confident film that is a delight to look at. The acting is, for the most part, good - there is very effective support from the likes of Peter Mullan, Daniel Mays and David Morrissey. The soundtrack too is spot on. So, why is it no better than an averagely good film? Well, for one thing, the plot is so complex that it is sometimes difficult to follow. There is, for example, one scene in which the behaviour of a character (which ultimately leads to her being killed) is simply inexplicable. We have to wait a further 30 minutes or so for an explanation of why she did what she did. This is most definitely a film that requires the viewer's undivided attention - so much so that watching it sometimes seems to be much more of a chore than a pleasure. In addition, it is sometimes difficult to discern, amidst the frequent scenes of gun violence and mayhem, exactly which character has been injured or killed. This is because several of the actors have a similar physical appearance to each other and because the action all too often takes place in a darkly lit, brooding atmosphere that makes it difficult to see exactly what is going on. McAvoy gives a very good performance as the obsessive detective hellbent on revenge (despite occasional lapses with his London accent!). And it is certainly the case that "Welcome to the Punch" is a stylish film. 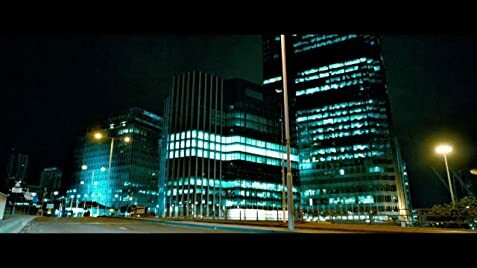 But it is ultimately also a bleak and empty one that, despite the money and behind the camera talent expended on it, barely raises itself above the level of a competent thriller. 6/10.